How the agent will be compensated. The Working with Real Estate Agents form/brochure also explains what may or may not happen if the agent ends up representing both the buyer and seller (called “Dual Agency”). Not all Realtors feel comfortable representing both sides of a transaction, but are required to educate you that the situation does exist. If they prefer not to be on both sides, they’ll likely arrange for you to work with another agent. 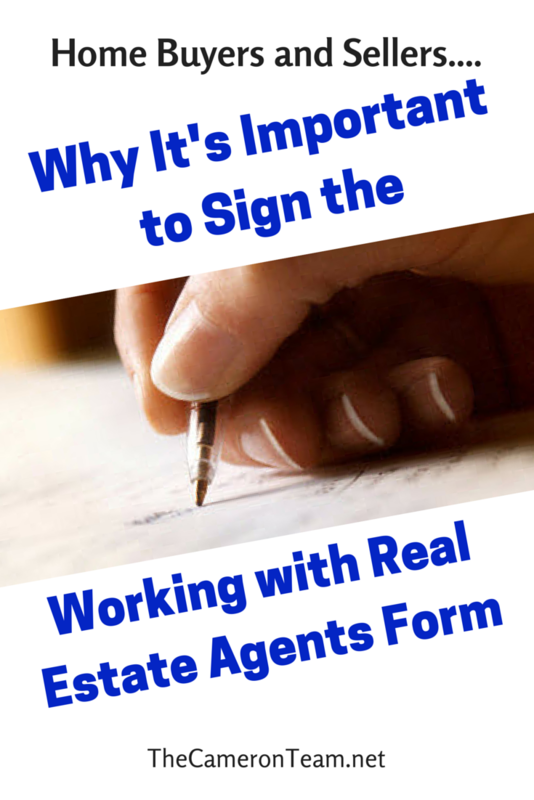 If you are a buyer and unwilling to work with the particular agent asking you to sign the Working with Real Estate Agents brochure/form, there is an additional section dedicated to Seller Subagency. When this section is checked, you are acknowledging that the agent is working for the seller and any information shared with them could be shared with the seller. Again, this isn’t a contract. When you sign it, you aren’t signing away any rights. This is an acknowledgement that you know what the role of a real estate agent is and what information may be shared. “Real estate agent” is a widely misunderstood job and this form/brochure is supposed to help improve that understanding. Basically, it’s the first step in protecting both parties involved in the business relationship. Of course, you aren’t required to sign it. However, the Realtor will make note that you refused. If any problems should arise later on, your refusal will be taken into consideration by governing bodies, but you will be doing yourself a disservice by not reading and understanding it. Finally, if you’ve already signed a Working with Real Estate Agents form with another Realtor than the one asking, you shouldn’t be sharing any details with another agent, because no one but your Realtor is really obligated to protect your best interests. If you go to an open house without your Realtor and tell the listing agent details about your motivation and opinion of the home, it could affect negotiations. So, tour, admire, and say, “Thank you for your help. We’re working with____,” but don’t share any other info. As a Realtor, that agent should know better than to solicit the business of another agent’s clients. If you have any questions about working with a Wilmington area real estate agent to buy or sell your home, give us a call or send us a message through our Contact page. We’d be happy to clear up any confusion you may have.